Give my regards to Broadway! Today's Friday Fun is applause .. applause .. applause for the arts in Hot'Lanta. One - It's increasingly expensive to tell the gang at 42nd Street that the curtain will be going up. So when my friend Sue Chappell, Executive Director of the Conyers Rockdale Council for the Arts, sent me an email link to an Access Atlanta article about an important grant the Council had won I immediately clicked to read. The mention was not only a nice acknowledgment of the funding but a bit of promotion for the excellent performing arts programs that Sue has worked hard to bring to the community. However, when I clicked into the article, what I found was rather tacky. A key word, that appeared it would link to the Council's website, linked to an ad. The link has since been deleted. But I can't help but wonder how many people were confused and then annoyed. In all fairness, I think those ads are random but still .. how tacky! 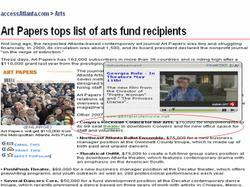 Sidebar: Conyers Rockdale Council for the Arts a multi disciplnary community arts organization that is NOT a part of government, but supported in its efforts by the community being served. Two - Congrats!to my friends at the Alliance Theatre who you just might find singing and dancing down Peachtree street. The Alliance Theatre is the Recipient of the 2007 Regional Theatre Tony Award for outstanding regional theater. AJC article. Wonder if their blog put it over the top? Three - Last night my friend Carol invited me to join her at Symphony. It was a great performance and letting the music wash over me was wonderful and much needed. Flipping through the program I found one of the most creative ads I've seen in a long time. In fact at first glance I thought .. hmm where do I sign up for this? Divas and Divos let's bring this one home to you ... support the arts in your community. Avoid the “water cooler” as gossip tends to be plentiful at this time. That’s all you need to slow down productivity. The rumor mill can spread like wild fire. Energies have a tendency to become very scattered in Gemini. Try to stay focused on the task at hand or you just may find yourself chasing your tail. Neptune turns retrograde on Thurs. 5/24/07 which may add to any confusion. Take time to go within and talk to yourself instead of trying to get everyone else’s input. Ideas may be more abstract than concrete at this time. Having faith in yourself is key.